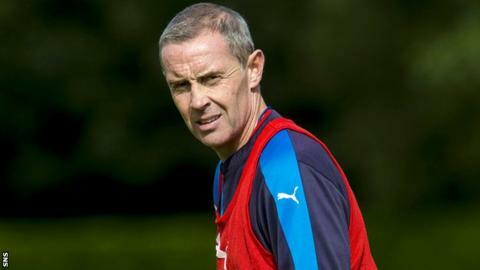 Rangers say Raith Rovers may have "besmirched the honour of" Ibrox assistant manager David Weir by querying the recalling of a player. Raith asked the Scottish FA compliance officer to investigate a potential rule breach after Rangers' Ryan Hardie was recalled from the Scotland Under-19s. Rovers player Craig Wighton remains with the Under-19s squad in Bulgaria as the club prepare to face Rangers. But Rangers say Hardie's return "was done with the approval of the SFA". Raith, who visit Ibrox on Saturday, said in a statement on their website they had asked Tony McGlennan "to consider whether he agrees that Rangers FC, through [assistant manager] David Weir, have breached SFA articles and rules by requesting and securing the early release of its player Ryan Hardie from international duty with Scotland Under 19s in Bulgaria, for the sole reason that he is then available to play against Raith Rovers." But Rangers responded in a statement of their own website: "Rangers FC insists there are no grounds for Raith Rovers' allegation that a rule breach may have been committed by the club. "Rangers also consider that Raith Rovers' spurious claim could have besmirched the honour of assistant manager David Weir by making specific reference to him. "Neither Rangers nor David Weir acted wrongly in requesting the return from Under-19 Scotland duty of Ryan Hardie ahead of tomorrow's Ladbrokes Championship match against Raith Rovers. "This was done with the approval of the SFA, within the rules and in the full knowledge that Raith Rovers would be offered the same opportunity to bring Craig Wighton, their loan player from Dundee, home. "They declined but then issued a statement alleging Rangers has somehow broken the rules. This action is baffling. "Rangers, as many other clubs have done in the past, acted within the rules and the very thought that David Weir, who served his country with great distinction winning 69 caps, might have been trying to undermine an international side is preposterous. "Rangers has also written directly to Raith Rovers chief executive Eric Drysdale seeking to understand his club's motive behind such vexatious action and an apology to David is the very least Raith Rovers should be offering."